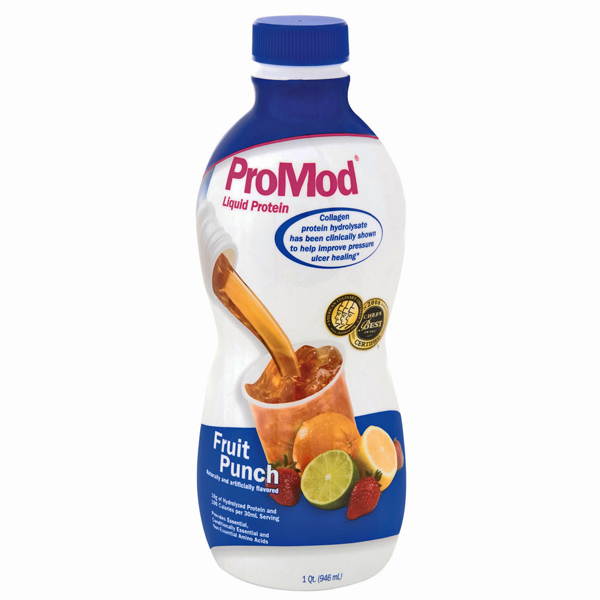 Promod Liquid Protein Supplement is a medical food that provides 100 calories and 10 grams of protein per serving. Promod Protein is ideal for those with increased protein needs for wounds, protein-energy malnutrition, involuntary weight loss, pre- and post-surgery, anorexia, stress, trauma, cancer and burns. Promod uses hydrolyzed collagen as the source of protein which has been clinically shown to help improve pressure ulcer healing. It can also be given to people with diabetes. It provides all essential amino acids. Glycerine is the carbohydrate source, and there are no simple sugars. Contains no fruit juice. Fat free, lactose-free, gluten-free, and low-residue. Can be used orally or with tube feeding (NOT for IV use). Fruit punch flavor. One 32oz bottle.